Sometimes Graffoto is blown away by an exhibition to which the street art epithet has only a distant relevance but it is still worth sharing the excitement. 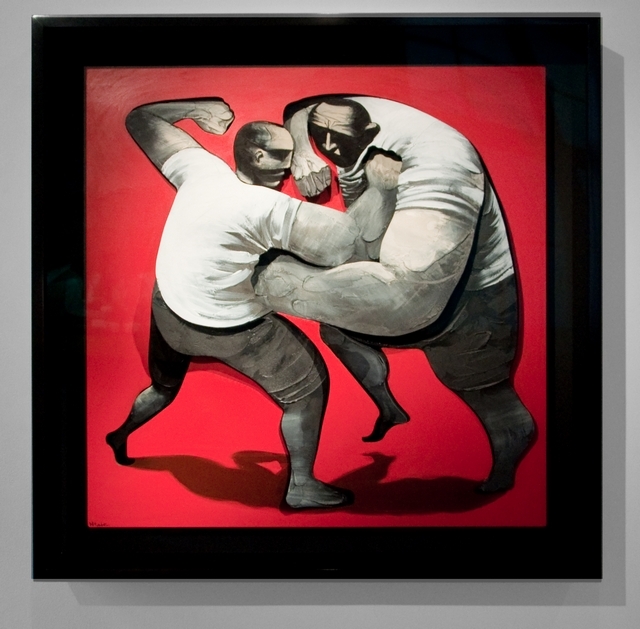 In the case of Adam Neate, the street art pedigree is undoubted, Adam was one of the pioneers of London’s street art culture but regrettably in 10 years of obsessing over street art we have never actually found a piece of street art by Adam Neate. And that includes lonely hours late into the night driving around North London on a wild goose chase when he deposited 1,000 screen printed portraits all over London in 2008. 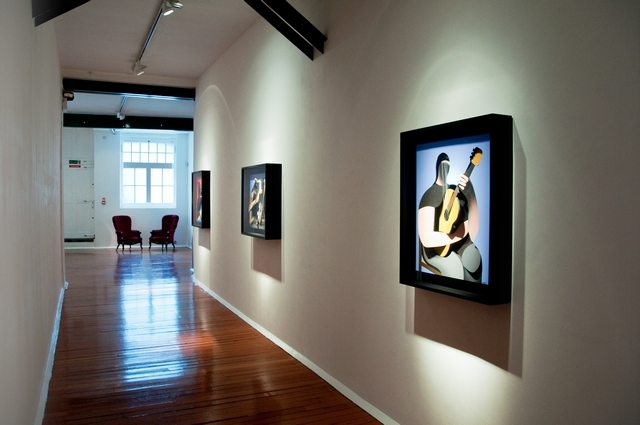 Exhibitions by Adam Neate at Elms Lester have always plotted and commemorated a timeline through his progress and development. We have seen the portraits, the introduction of movement, the playing with light, shadow, colour, the 3D “Dimensionalism”, the use of perspex. This show is no different as we now see Adam taking up the use of wood and a return to painting, playing with the texture of the paint itself. Tilting shapes cut into sheets of wood provides Adam Neate with a new means to explore depth and relief in a single sheet. 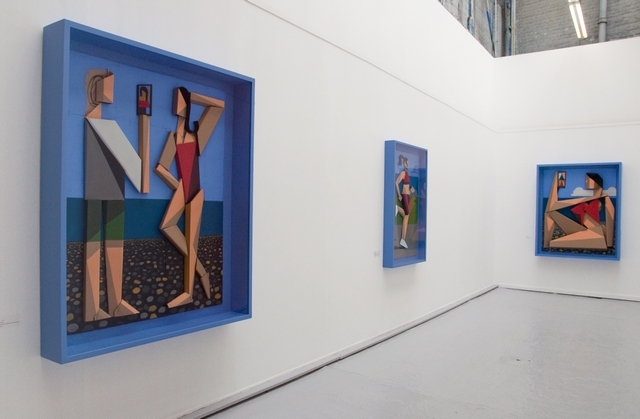 The tilts and steps between adjacent layers of wood provide depth and shadows in a lot of the art in this show. The effect is pulled off most spectacularly in “The Horse Race” with elements such as the reins in the rider’s hands actually are the cuts between adjacent panels of wood and the legs rising out of the plane of the image create their own shadow. Craftsmanship here has been raised to the level where, as we understand it, Neate can achieve these contrasts of depth using just one single cut piece of wood, nothing added, nothing taken away apart from a pile of sawdust. From a distance (and when viewed in an online picture) the image takes on the appearance of a flat painting, for full impact get close enough to smell the jockey sweat. 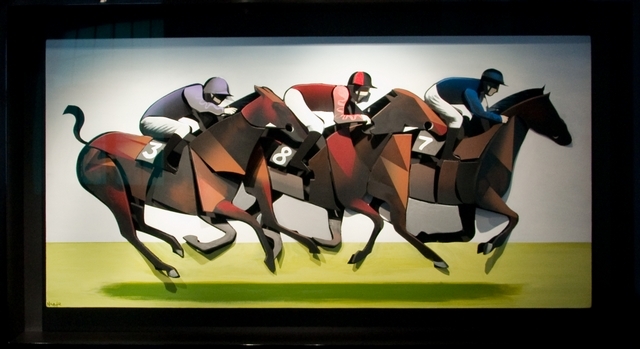 As well as manipulating the cut sheets of wood, Adam Neate has also experimented with groves incised into the wood. In The Concert Pianist the view is over the shoulder of the player, across the piano towards the auditorium. Humanity is created by grooves in the wood in the background and also the planks on the stage are grooves cut into a single piece. The theatre curtain hangs slightly proud of the scene while the piano is a masterpiece of wood shaping and painting, check out the painted reflection of the piano keys. 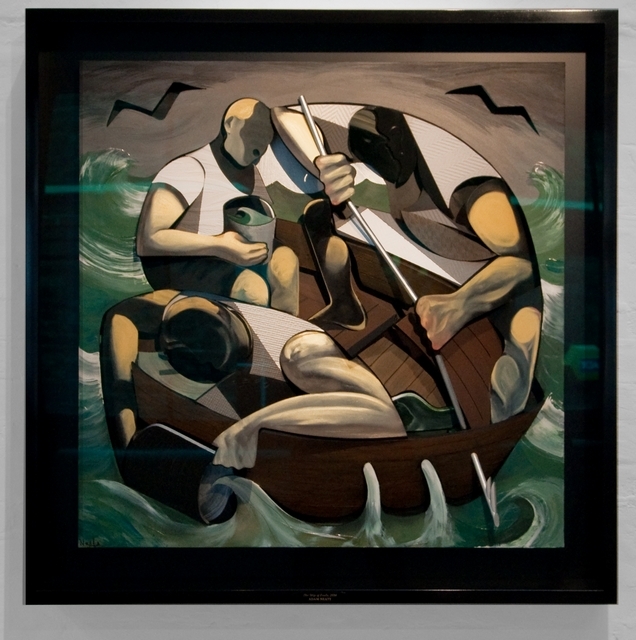 The most breathtaking piece in this series is “The Ship Of Fools”, three men in a tub assailed by a storm bail their boat. One suicidal mariner is penetrating holes into the side of the vessel to let the water out, there is some technical merit to this, it would reduce what salty sea dogs refer to as the “free surface effect”, true. A land lubber in the background vomits into a bucket while in the foreground someone frantically bails. Unconcerned by the elements and the looming tragedy a pair of seagulls circle overhead, these are cut shapes in the wood whose edges are painted white and as you move around the image, you see flashes of darkness and white just as you would glancing at real seagulls banking and swooping overhead. Cut wood surface rise and fall out of the plane of the painting while paint and lacquers play with the light and shadows. Through these details Neate weaves his magic. Friends of this blog have raved about another image, the pretty big (we love this kind of special art language) “The Brothers”. Personally I found this image rather static and cartoonish, it seems to cry out for the missing dynamism of a serious sibling squabble, it lacks that trademark movement. 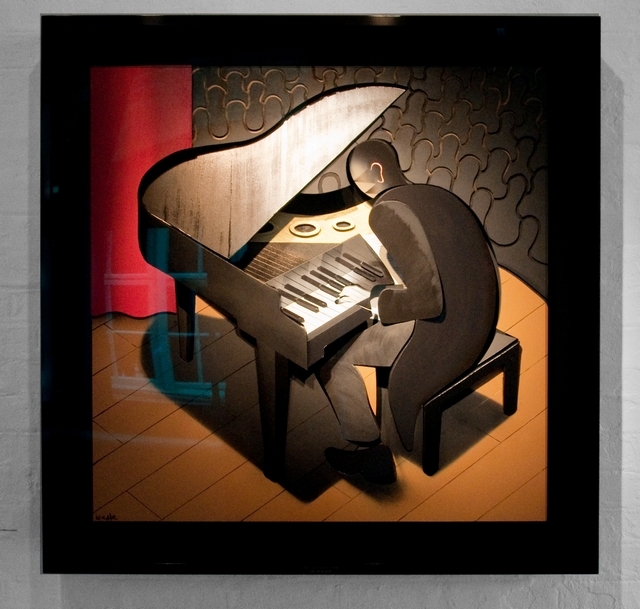 12 years ago, Adam Neate was painting portraits on cardboard which he left in doorways across East London. It disappeared from the indoor art about 4 years ago but Neate has gone back to working with cardboard in a bright summery series of cardboard images inspired by the seaside. 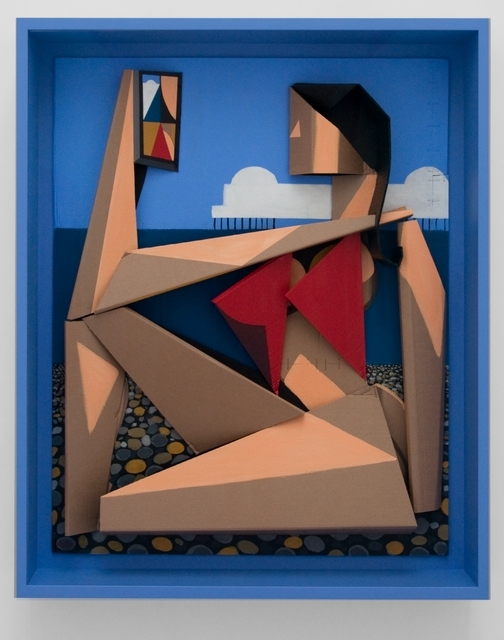 As well as following up with tilted constructed planes like in the wood pieces, Neate has pursued a distinctly cubist representation of figures and clothing. Contemporary narcissism is captured in the pre-occupation of the bathing beauties taking selfies on their phone, the image on the phone screen combining flesh and bikini tops. A trio of small red portraits routered in wood with their blurry, painted portrait edges hark back to Neate’s focus on representing movement. Over the years the rewards garnered by his talent have priced his gallery works well out of the reach of mere mortals but Adam is currently rectifying that with some very attractively (suicidally!) priced editioned dimensional pieces. 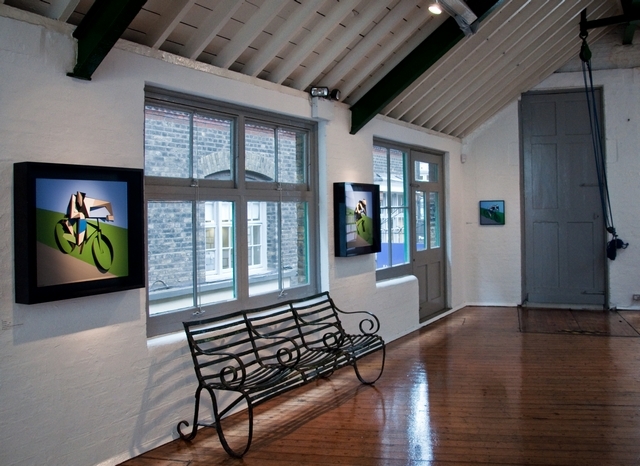 All three, The Hug (sold out), The Cyclist and London Bridge are exhibited and in the case of the first two the originals are also on display. 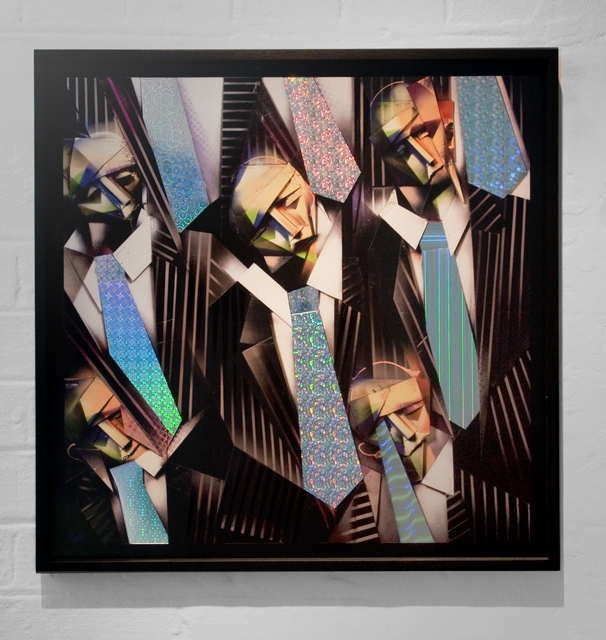 London Bridge captures a scene of grim business men commuting across London Bridge, their dark impressionist faces are in the classic Neate vein but the extraordinary element is the holographic ties they are wearing. Interestingly the gallery has two "London bridge" on display and the difference between the one displayed under natural daylight and the one under artificial gallery light (often referred to as “a light”) is quite dramatic. Most art appears better in the flesh than in small images on a cell phone but in this case, only real life lets you differentiate between what is shadow and what is paint and to see how different points of view dramatically affect the perspective between the different layers. 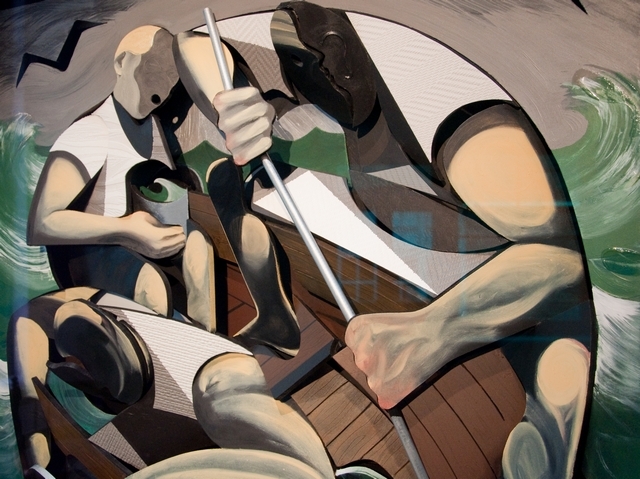 No amount of photography when reduced to blog friendly resolution can convey Adam Neate’s wide ranging exploration of the textures and finishes of paint that he has applied to the various surfaces. Until Graffoto’s web enabled holographic feel-o-vision gains wider use and some semblance of technological adequacy, you will for the time being have to get along and see for yourself.